Flu season is upon us, and before long it's likely to seem like people are coughing and sniffling everywhere you turn. New research sheds light on a group of people who may be especially likely to spread the infection to others: millennials. According to the new survey of 1,800 American adults released by CityMD, millennials (ages 18-34) who have had the flu or flu-like symptoms were much more likely than those 35 and older to have ventured out the last time they felt sick, potentially exposing friends, neighbors and co-workers. About three-quarters of millennials admitted to going out sick, compared to 56 percent of older adults. Of those who left the house, the most common place they went was a drug store, followed by a grocery store. Nearly 40 percent said they went to work sick. Smaller numbers went to a family or friend's house, a restaurant or deli, public transportation, and even the gym while they were ill.
"Most millennials are young and healthy. Many of them probably never even had the flu before so they may think some of their symptoms are just extended cold-like symptoms and so they may underestimate how long it takes to recover from it." Dr. David Shih, executive vice president of strategy, health and innovation at CityMD, told CBS News. Shih said in general, many healthy young people tend to "think they're invincible." However, this attitude is problematic because even if they can bounce back quickly, they may be putting others at risk. "The flu is one of those silent and contagious diseases that we see every year and millions of Americans get the flu. Unfortunately, there are some population segments that are more at risk like the elderly, the very young, and pregnant women," Shih said. "When we have a large population who are out and about in public spaces with the flu, there is a higher exposure." For many, the flu causes moderate symptoms that ease after a few days, but for others it can lead to severe illness and sometimes even death. According to the Centers for Disease Control and Prevention, the flu has caused between 140,000 and 710,000 hospitalizations and between 12,000 and 56,000 deaths annually since 2010. The numbers can vary widely depending on how severe each year's flu season turns out to be. Health officials are concerned that the 2017-18 flu season in the U.S. may be particularly bad because the Southern Hemisphere, especially Australia, was hit hard over the past few months with a flu strain that's notorious for causing severe illness, especially in older adults. People with other serious health conditions are at greater at risk of dying from the flu, but even young and otherwise healthy people can sometimes develop fatal complications. Will a flu shot really work? The CDC recommends everyone age 6 months and older should get a flu shot before the end of October, if possible, each year. This is the primary means of prevention against the flu. Flu vaccines cause antibodies to develop in the body, which takes about two weeks after vaccination. The seasonal flu shot protects against the four strains that research indicates will be the most common during the upcoming season. "Now, there are times where they may be off or they may be wrong, but getting a flu shot will still decrease your likelihood of getting the flu because there's always going to be some minor variations but there's definitely enough similarities for your body to pick up the defenses," Shih said. Studies have also shown that even people who get the flu despite having gotten the flu shot tend to have milder symptoms and recover more quickly. The common cold and the flu are both respiratory illnesses but they are caused by different viruses. 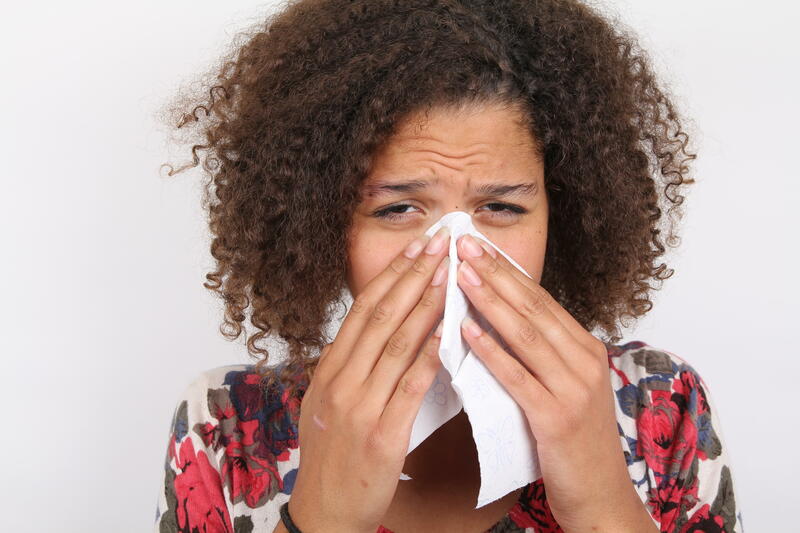 Colds are usually milder than the flu and people with colds are more likely to have a runny or stuffy nose. If you're not sure whether your illness is a cold or the flu, there are tests your doctor can run to find out. The virus is spread mainly by droplets in the air when infected people cough, sneeze, or talk. People who are sick with the flu can spread it to others up to 6 feet away. In order to prevent spread of the flu, those who are sick should always cover their mouths when coughing or sneezing and wash their hands frequently with warm water and soap or use hand sanitizer. Flu germs can also last on surfaces for up to 24 hours, depending on the surface. The harder the surface, the longer germs can last. So, one person with the flu who coughs into their hand and then later grabs ahold of a doorknob or picks up the office coffeepot can quickly infect many others. How long are people with the flu contagious? Shih says many people believe that after one or two days, you are no longer contagious. However, that's not true. "As long as you're coughing, sneezing, dripping, you're exposing germs whether to the air or to a surface," Shih said. While it's very common for people to want to get back to work and their daily routines soon after getting sick with the flu, experts advise against rushing things. The length of the illness will vary from person to person. Young, healthy people may bounce back very quickly, but in others flu symptoms may take up to two weeks to completely go away, Shih said. "The general advice for a patient is to really take the 3 to 5 days to rest and only exercise and go about your daily business once you feel you have the energy," he said.